A huge memorial service has been held for the victims of the deadly plane crash which wiped out a Brazilian football team. 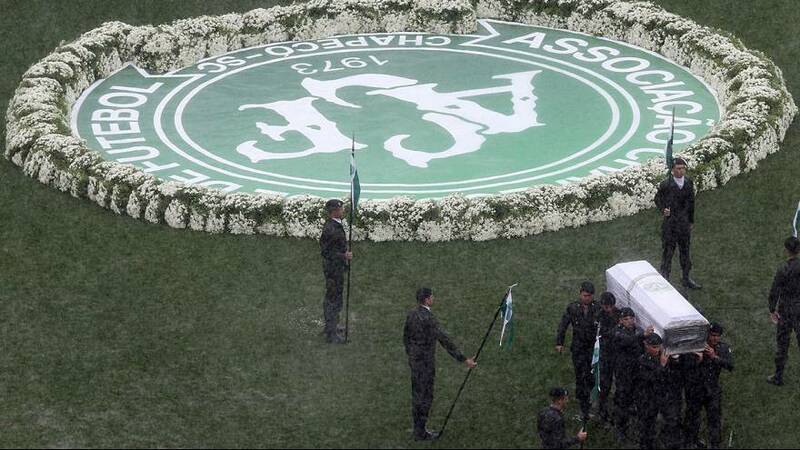 Braving terrible heavy rain, tens of thousands of mourners filled Chapeconense’s stadium in southern Brazil as the bodies of 50 victims were brought into the Condá arena. In all, seventy-one people died in the LaMia Airlines flight on Monday when it crashed outside Medellin in Colombia. Only six people survived, including three members of the team. Brazilian President Michel Temer was among the thousands of mourners to honour the dead. The disaster has rocked Chapeco city and more widely Brazil to its core. After a dream season, Chapecoense Real were set to play the biggest match in their history. The cause of the accident is still not known, though it is suspected the plane ran out of fuel after a recording emerged of the pilot requesting urgent permission to land.